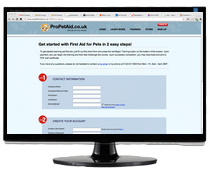 How does online pet first aid level 2 (vtq) training work? 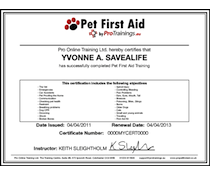 Pet First Aid Level 2 (VTQ) is a video-based, online training course that instructs you how to care for your pet in case the animal is injured. This course is devised to give you the confidence to act quickly in an emergency while offering the convenience of learning from any computer with an internet connection. This course is not meant to replace your vet in an emergency situation. However, it will teach you the skills you need to care for your pet before the vet is able to see the animal. For a full list of topics covered, browse the course curriculum. Register on the website and purchase your online seat for £24.95 + VAT. This seat will never expire, so you can start whenever you like. Watch the training videos. You are free to stop and restart any time during the training. Complete the final test and print out your personal certificate. You are now prepared to help your pet in an emergency.